Not all polishes are created equal. I've come across many colors. I'd say for the most part I like to love most everything on this blog. There are some stinky colors, but in general I'm overall pleased. Then there are these colors that just blow my mind. There is a difference from just loving a color, even REALLY loving a color, and being completely gobsmacked by one. 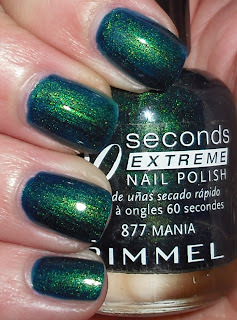 This Rimmel polish, holy bananas is S-P-E-C-T-A-C-U-L-A-R! 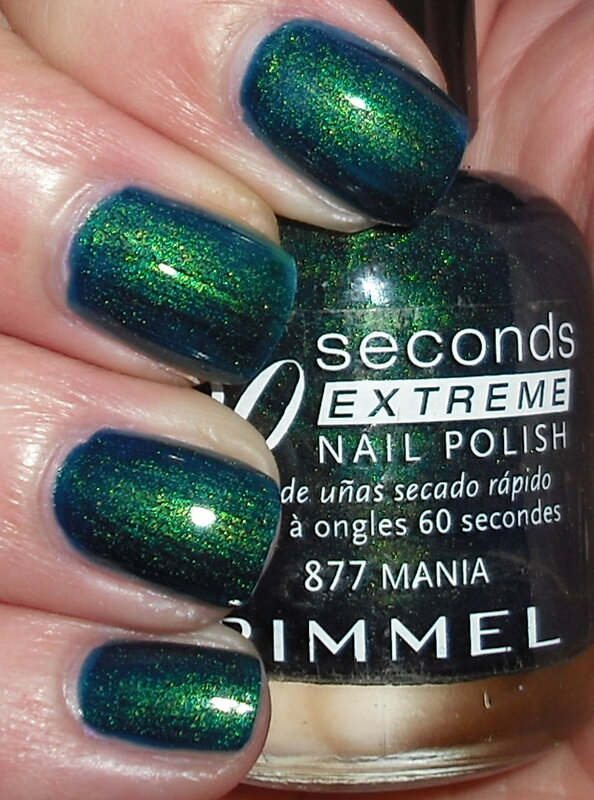 Mania is deep inky teal duochrome with a golden-greenish iridescent micro shimmer. Yes, it is one of those that requires a multiple photos. Depending on the light this could be an emerald green, deep teal, and various other shades of beautiful blue and green. It kind of has this syrupy look to it, that I really can't describe.I'm convinced Rimmel didn't make this, fairies, mermaids, elves, wizards or something otherworldly did. It was probably made along with the Great Rings forged for Elves, Dwarf Lords, and Men in Middle Earth. This is an older polish. I have no idea where it comes from or when it was made. I got this from Kari from Once Bitten. 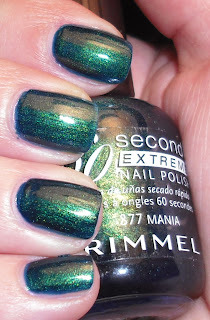 Her, Kimberly from Libby's Pink Vanity, and I met up for lunch a few weeks ago and exchanged a few polishes. Kari did not want this one. When I got home and swatched it, I had to message her and ask if she was sure she didn't want this?!? She said it stained her nails. She's right this stains your nails, but I'm so willing to let that slide. Stain my nails all you want! the first photo of this is gorgeous! LOL I'm glad you love it so much!!! It looks stunning on you! OK. First. Awesome that you got to meet up with Kari & Kimberly - totally jealous. Second. This polish is gorgeous and DEFINITELY warrants more than one pic. So, so pretty! And who cares about stains when the color is THIS color? Is this a lord of the nails mani? I love it! pretty color!!!! 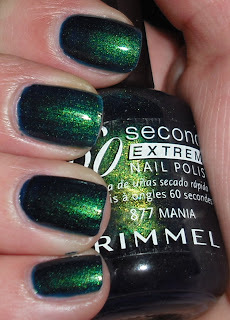 Lol I love your description of this polish. But I agree, it's quite amazing! That is pretty, I would buy it! This is gorgeous! I like that it has so many different looks in different lighting. I know! Stains I don't 'care, it's worth it! Haha, yes it is. Thanks! :P It's that amazing! It can't be of this Earth! Jk, I can't stop myself from geeking out. Gorgeous! All greens stain I think. In love with this duochrome!!! Such a pretty color! new follower to your blog, and another FL gal! I love that green! Wow, this really is beautiful! I love th duo-chromeness!